Here at Tea Trekker we tend to use a heavy hand with the dry leaf measure so that we can re-steep this tea many times. We also enjoy steeping it for 5-6 minutes on occasion. We work directly with Jun Chiyabari Tea Garden for the teas that we offer from their gardens. This spring the lot of MoonDance tea that we sampled really impressed us with its richly buttery and slightly brisk flavor and fresh, exuberant aroma. One sip and we were on the phone placing our order, to be sure that our order would be taken from that same lot. This is the same logistic as has been happening the last few years with these small batch teas. Those of you who were fortunate to enjoy our MoonDance tea in 2017 will notice a significant visual difference between last year’s tea and this year’s tea. Last year the leaf was small, open and dry, and the buds were extremely slender with an abundant silvery down that made them contrast greatly with the leaf. Our 2018 lot is more uniform in coloration – that beutiful green/gray/stone color but the leaf curled readily during the very slight rolling that this tea needs. This is due to the difference in residual moisture in theleaf. The 2017 was very dry and the weather was cool; whereas in spring of 2018 the weather was much more moist and a more normal temperature. This led to leaf that was ‘juicier’ and could hold its curl better and ‘fix’ its shape more readily. The overall flavor is quite similar, although we think the concentration of flavor is higher this year and the tea is even more full-bodied, with a lush richness. This phenomenon represents an enthusiastic trend for some tea gardens, which is to focus on high-end, exclusive micro batches of tea. The quality of leaf in early spring is very high and just right to turn young, juicy leaf with an abundance of flavor and vigorous aroma into delicious tea that deserves to be maintained as a separate ‘lot’ and sold as such. Production of teas such as this occurs during the short time between bud break and when the main harvest begins. So the window of time for these early spring teas is very short and the quantities made are very small. Is this tea expensive? Yes. Is it worth the price? Yes. However, the price has dropped by almost a third from the 2017 price, so that is great for those of us who like to drink this delicious tea. In fact, we like it so much that we purchased as much of the entire batch as we could, allowing for a few kilos that went to a fine tea shop in Europe! Because this leaf can be re-steeped 2-4 times, it is actually less expensive to drink than many other teas that seem to have a lower retail price per pound. This tea has it all – skillful plucking, careful manufacture and an impressive and very long-lasting taste and aroma in the cup. The color of this tea is buff/stone/green and on first glance, one might assume that this is an early spring green tea. But this batch of fresh leaf was processed in the tea factory into a white tea. 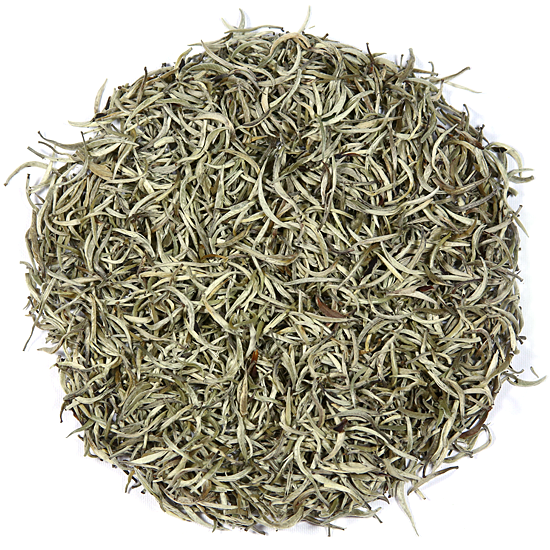 For those unfamiliar with white tea, the processing begins with a withering step, either indoors or outdoors, which introduces a small amount of oxidation to the leaf. The oxidation tempers the astringency of the fresh leaf and, in this case, gives the tea a smooth, floral style with a slight taste of a mild black tea. In fact, depending on the criteria that one chooses to use, this tea could arguably ‘technically’ be classified as a black tea, as well as a white tea, because it truly does fall right on the dividing line between the two categories. Our Nepal Himalaya White Moon Dance has very high fragrance of melons, tropical fruits and assorted florals. In the cup the tea is buttery with a very rich mouth feel. The tea has a core flavor from the oxidation which adds definition and structure – i.e. long-lasting flavor and aroma throughout multiple steepings. We often find that high fragrance teas do not correlate to abundant flavor in the cup, but that is not the case with this tea. The high fragrance is just an introduction to the bountiful flavor that follows in the cup. You will find that this tea has a flexible steeping time – and will yield more re-steepings than most white tea. Himalaya White Moon Dance will re-steep numerous times (short steeps) or you can leave the leaf in the water for a long time (we recommend slightly cooler water for this method) and enjoy an incredibly rich, deeply-flavored tea (perfect for iced tea). It is a very user-friendly tea that will delight the eye, the nose, and the palate. Jun Chiyabari Tea Garden is a small & exclusive single estate tea garden located in the Himalayan hills of mid-eastern Nepal. These tea gardens are located at 6,000 to 6,500 feet in the ‘hills’ around Hile, a typical Himalaya hill-town, about 15 km west of Ilam (the major tea-producing region of eastern Nepal) not far from Sikkim and Darjeeling to the east, and Sagarmatha (Mt Everest) to the north. As the garden’s tea director says: “Hand-rolling is a laborious and time consuming task that requires patience, tender touch and a passion for creation from the person rolling the leaves to ensure that everything is perfect. This is why only women are selected for this delicate task”. 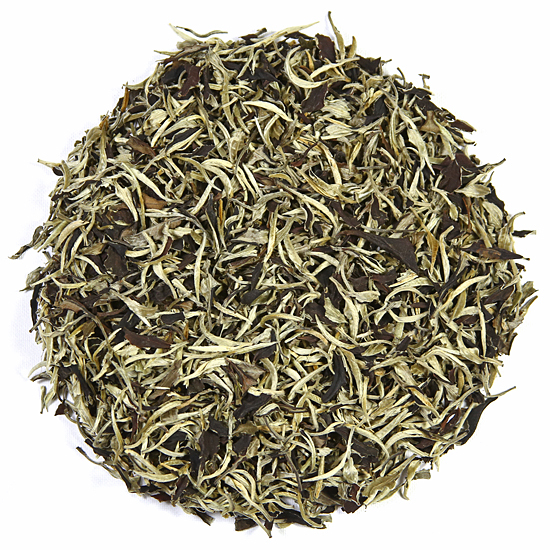 Tea Trekker’s MoonDance tea is barely rolled – the tea maker refers to the level as ‘Ghost Rolling’, but it does its job in dispersing the oxidation evenly on the juicy leaf.